So, that's possibly the longest title I've ever squashed into a box in a review! Let's do this thing... first, the blurb. Greta is an ordinary(ish) eleven-year-old orphan girl with journalistic aspirations. This weekend she's writing a big story about the Thirteenth Annual Festival of New Stuff (TAFoNS for short), being hosted by her absent-minded inventor aunt... who has gone missing. Can Greta find her aunt and answer the riddle of her mysterious missingness? In the meantime, all across the town, people are being eaten by giant amoeba monsters that have emerged from the pit at the end of Greta's garden. Before I get to the review, I need to confess to something. I can't write funny books. I mean, I've really tried but it never sounds convincing and always ends up feeling exactly what it is - clunky and amateur. I can write short bits that are funny, but I can't sustain it. I envy people who can write funny, and A.F Harrold totally nails it. 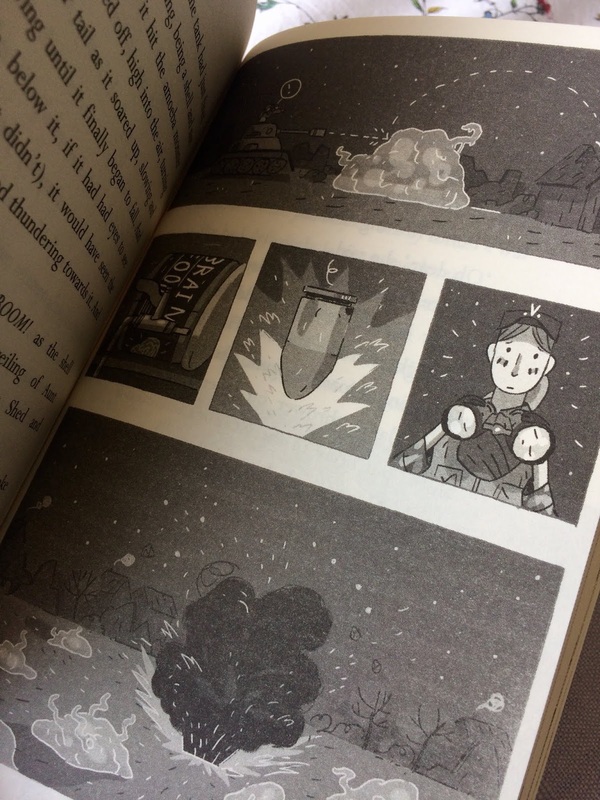 Greta is the perfect central character, and we first met her in Greta Zargo and the Death Robots from Outer Space. 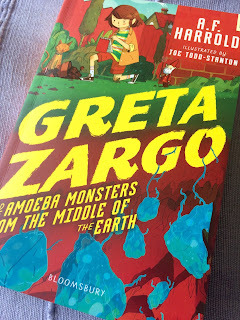 Greta is an independent 11 year old (for complicated but perfectly reasonable reasons) and it has fallen to her to save the people of Earth from all sorts of hideous things. 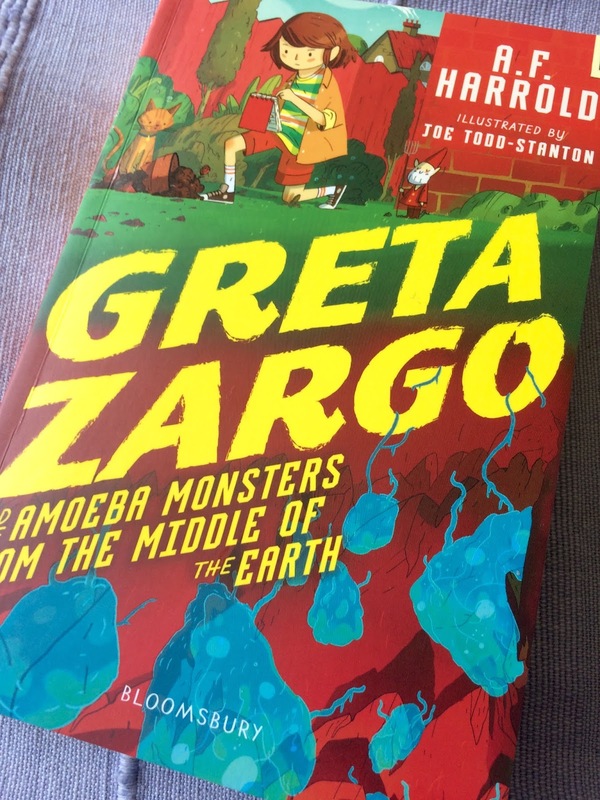 In this (book 2) she is (obviously) saving us all from jellylike amoeba monsters who have a voracious appetite and a tendency to swarm over living things and dissolve them. Along the way we meet all sorts of wonderful characters (although I can't say I'm exactly happy with the librarian from the Immobile Library - elderly lady in a tweed skirt? hmmm - although I'd love a tiny ostrich, and I do have a tweed skirt...) Where was I? Oh yes, wonderful characters. Loads of 'em, and all wind the adventure along until things speed up towards a thrilling and very satisfying climax. Along the way we are treated to Harrolds' clever and slightly twisted sense of humour. I genuinely laughed out loud at the names and witty twists. How could I not laugh at Bogof Boredom, Hester Sometimes, Hamnet Ovenglove (world champion onion wrestler) and Rashomon O'Donoghue (All-England Tiddlyblinks champion). With footnotes (which are actually sidenotes - they are literally on the side) and wonderful comic-book style, slick illustrations from Joe Todd-Stanton (many of which I can't show you because they'd blow the story, including an awesome double-page spread showing the amoebas... well, you'll just have to read it), this is a brilliant book for all kids (and grown-ups) who like a well-written suspenseful adventure that is also rollickingly funny. You can find more about A.F Harrold's books (and his beard*) by clicking this link.